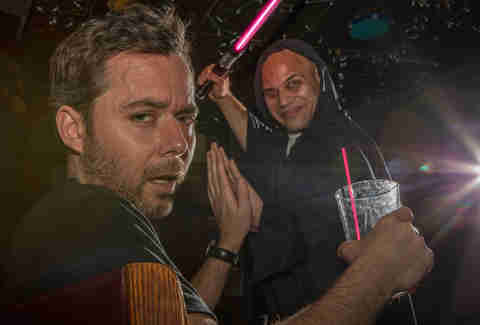 A noble bartender uses the Force for knowledge and defense, never for attack. But when threatened by annoying customers, there's no shame in using a little trickery to convince them that these aren't the beers they're looking for. 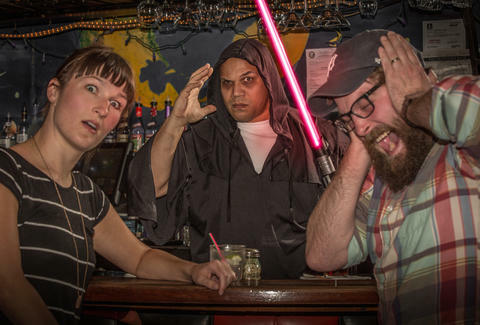 To find out how best to placate the service industry's most undesirable patrons, we polled a group of clever bartenders for the surefire tricks they use to turn an annoying customer away from the Dark Side. Or just from the bar. "Ask the customer to come talk to you outside for a minute, then tell the doorman not to let them back in." "Listen carefully, nod accordingly, smile extra big (it helps if you're attractive), and then give them a free drink. Problem solved." "Depending on the person, I'll load the jukebox with crap music and turn it up loud. If they're old, I'll play rap or metal. 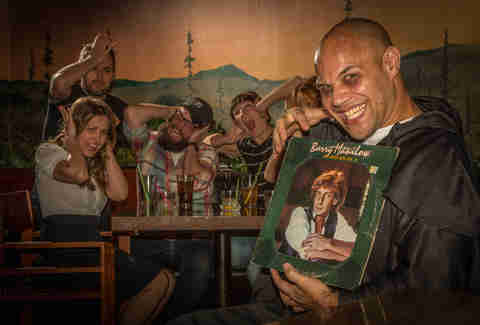 Young, put on Tom Jones or Barry Manilow. If they complain, I use the 'Bartender Is God' card and watch them walk out in a huff. Loyal regulars know what I'm doing, so they enjoy the show." "If someone is using drugs, I just take them and throw them away. I usually dare them to call the police." "If someone says, 'Don't you know who I am?' I usually reply, 'Can someone help this man? He doesn't know who he is!'" "A classic move to placate a belligerent or downright annoying customer is to pour them a weak drink. If they're in a right enough mind to notice, they'll just go elsewhere. If they're not, at least they'll be sobering up." "If a customer insists on picking your brain during a rush about what your favorite drink to make is, the right answer is always the easiest: a daquiri or gimlet." "If someone says they can't taste the vodka, I usually tell them that's the idea. And also, that every drink is carefully measured." "If I knew a group of folks were gonna be slow to leave after close, I'd approach the table just after closing with a pint of beer in my hand. I'd ask if I could join them for my after-work beer and make them promise to leave when I finished. They'd agree, I'd sit and slam the pint, and then invite them to leave. It generally caught them so off guard and was presented in such a good-natured way that they'd all get up and laugh as they left." "I've called the bar with my cell and acted like the offending party's wife called, and that she was pissed off and heading to the bar. He downed his drink and got out of there." "I said, 'I feel so sorry for you right now, I can't imagine how you must feel.' She started crying, he paid his bill and never came back." "I would ask a rowdy group of guys if they would act the same way if a cop was sitting next to them. Then when they said no, I'd ask if there needs to be." Dan Gentile is a staff writer on Thrillist's National Food and Drink team. His go-to Jedi mind trick involves Shadows of the Empire on N64. Follow him to video game nostalgia at @Dannosphere.